Thanksgiving is all about feasting. But in addition to the massive amounts of food consumed, there are massive amounts thrown away - and not just on the holidays. "Having plenty is part of the point of Thanksgiving," said Jonathan Bloom, the author of "American Wasteland." "The real problem is that, increasingly ... there's less of a distinction between the holidays and every day." In his recent book, Bloom reports that the average family of four throws out about $1,350 of food each year. A 2009 study from researchers from the National Institute of Health estimates that about 40 percent of food is wasted on its journey from farms to our stomachs. Meanwhile, a staggering number of people in the country are having trouble putting food on the table. "What we've seen since 2007 is a massive increase in the number of people seeking food assistance," said Ross Fraser, a spokesman for Feeding America, a network of 200 food banks across the country. Fraser said that in 2006, 25 million Americans were seeking food assistance, and that number has jumped to 37 million Americans a year. Groups like Feeding America and Ample Harvest, which helps connect gardeners with excess produce to food banks, are trying to bridge the gap between what is grown in fields and never used and redistribute it to the people who need it. And while a lot of waste occurs during production and distribution, a recent study in Tompkins County, N.Y., found that about 40 percent of food waste occurred in the home - more than any other link on the chain. 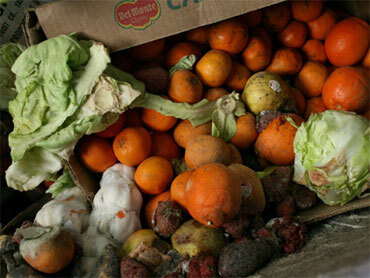 Much of that food waste ends up in landfills, producing methane gas. A study in the American Chemical Society's journal Environmental Science & Technology estimates that the United States could save 350 million barrels of oil a year by eliminating food waste - 2 percent of annual energy consumption. So what can individuals do? - Before you go shopping, take a look at what's in your pantry, refrigerator or freezer. That jar of pumpkin or cranberry sauce from a year ago will still be fine - and baking ingredients like pure vanilla extract will last years. - Take advantage of your freezer. Holiday related food like turkey, stuffing, gravy and cookie dough freeze well, but so do other items you might not thing of - like eggs, herbs and even leftover wine to later use for cooking. - Don't just use your freezer as a way to delay throwing food out. Buy masking tape and a marker and label what food is and when you put it in the freezer. Then keep a list on your fridge of what you've got in there so you don't forget. This week, CBS News anchor Katie Couric spoke with two leading advocates who are trying to bring an end to hunger in the United States. Watch the interview below.